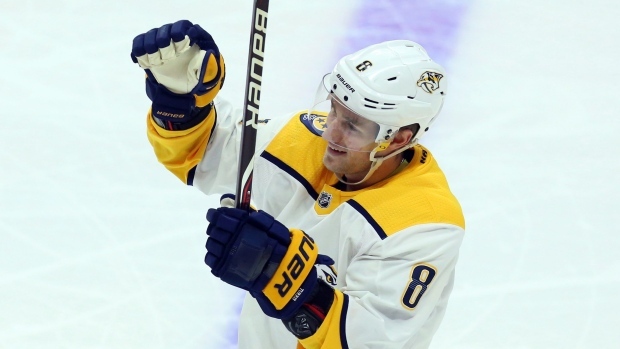 Nashville Predators forward Kyle Turris has been added to Team Canada's roster for the World Hockey Championship. The 28-year-old will join the team in the next few days. Kyle Turris has been added to Canada’s roster, will join the team in a few days. Turris is available now that the Predators are out of the playoffs, having been eliminated by the Winnipeg Jets in seven games in the second round of the Western Conference playoffs. Turris, who joined the Predators midway through the season from the Ottawa Senators via trade, had 16 goals and 35 assists in 76 regular season games and another three assists in 13 games in the postseason. Team Canada currently sits fourth in Group B at the World Hockey Championship with a 3-0-1-1 record after losing 5-1 to Finland Saturday.